Grains are mixed in overnight trade. Corn seeing a little strength, up 2 cents. Wheat down 1 ¼ cents and beans unchanged. China’s soybean imports and soybean meal consumption are expected to stall in marketing year (MY) 2018/19 due to ongoing trade tensions between the United States and China and an outbreak of African swine fever. Some look for U.S. corn harvest to be near 75-78 pct done and soybean harvest 84-85 pct done. The USDA’s initial OCE (Office of the Chief Economist) forecasts on Friday put 2019 corn acreage at 92.0 million acres, up from 89.1 mln this year, with soybeans at 82.5 mln, down from 89.1 mln in 2018. All-wheat plantings for 2019/20 at 51.0 mln would be up from 47.8 mln in ‘18/19. 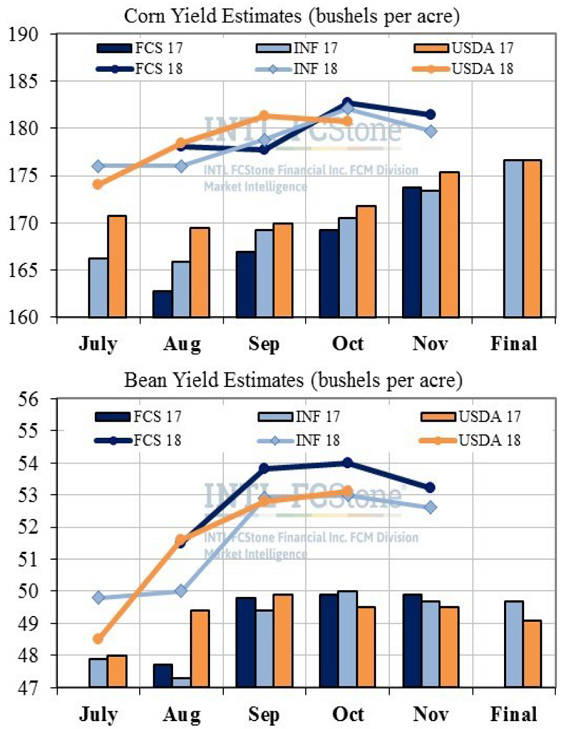 Next USDA WASDE report will be released Nov 8th at 11 a.m.
Informa on Friday cut their 2018 U.S. corn yield estimate by a little more than what was probably expected, moving below the 180 bushels per acre level this month to 179.7 bpa (versus 182.1 bpa last month). That still only stands a bushel below the USDA Oct estimate, but confirms the trade bias of steady-to-lower numbers since the USDA peak in Sept and private estimates peak last month. The government and both private firms now stand with 0.6 bpa of each other with current bean estimates (52.6-53.2 bpa).